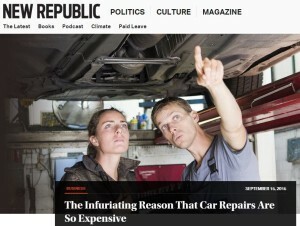 That’s what seems to have happened with freelancer David Dayen’s PARTS Act analysis “The Infuriating Reason That Car Repairs Are So Expensive,” which appeared Tuesday on the influential liberal magazine’s website. Dayen criticizes the automakers — and indirectly, their parts suppliers — for increasing the filing of design patents, which protect the look of features such as headlights. That’s why you, Mr. Main Street, must pay so much for your car repairs, he argues. The legislation cuts the life of an automotive design patent to 30 months from the 14-15 years they are today. See the official Congressional page on it here. First, Dayen ignores that any other business in America is subject to the same rules on design patents. If Ford can patent the look of something, so can anyone else. So why should other vehicle manufacturers like aerospace or bicycle manufacturers get to keep their design patents for 14-15 years, but not automakers? Let’s say you have a grille design you’d like to patent, such as the distinctive BMW “kidney” grille. Just because a consumer can get a version that looks identical in 30 months under the PARTS Act doesn’t mean it’ll behave accordingly if it’s been engineered (whether utility-patented or not) to do something like protect pedestrians as in the Hyundai example. The bulk of the case is lifted right out of the insurance industry’s talking points, some of which can be also seen in a burst of recent PARTS Act social media activity by the PCI. Generic car parts are far cheaper than those from the Original Equipment Manufacturer (OEM). The American Insurance Association estimates that generic parts save consumers up to $2.4 billion every year. A study comparing individual parts by the Quality Parts Coalition showed variances between OEM and alternatives as high as 50 percent, for a Nissan Altima front bumper cover, or 41 percent on a front air dam for a Dodge Pickup. Consumers don’t always recognize this, as their insurers pick up the tab, but they feel it eventually in higher premiums. The Property Casualty Insurers Association of America estimates that this patenting practice, if applied to every car part, would cost insurers an extra $1.5 billion a year. So that’s three trade groups with an obvious stake in the issue cited. The PCI and AIA are self-explanatory; insurers want to pay as little as possible on a claim and compete as aggressively as possible on premiums. The Quality Parts Coalition’s membership includes figures from the insurance industry, including the PCI and AIA; aftermarket parts industry; and NSF International, which has a stake in certifying aftermarket parts. Humorously, the piece cites a 2013 PCI report which has apparently been altered since we saw it last. The one’d we’d seen mentions that without aftermarket parts, you’d pay $24 more a year in premiums, which is about $4 more than a year’s subscription to the New Republic. The version on the PCI site now deletes that $24 statistic — and actually scales down the “benefit to consumers” by nearly $1 billion, which means the premium savings would actually be less. Dayen’s arguments also collapse when you consider that the aftermarket and insurance industry seem to have been doing just fine without the PARTS Act’s help. CCC’s 2015 Crash Course found the percentage of appraisals with aftermarket parts rose from 2009 to 2014 — the same time range when according to Dayen’s research, the OEMs were increasing design patents. It also found the percentage of aftermarket parts dollars increasing too. Meanwhile, insurance premiums were growing between 2008 and 2012, according to the most recent National Association of Insurance Commissioners’ data. Repair bills did increase between 2009-14 by a little less than $300, but CCC noted that these gains might have resulted from newer vehicles post-recession and more complicated, uncopyable parts like safety sensors. “With the average price per part for newer model year vehicles tending to be more costly than for older models – either due to less competition or complexity of the part itself – the combination of more parts at a higher cost are a key factor driving up repair costs again post-recession,” CCC wrote. So the OEM parts aren’t what you’d necessarily be replacing by aftermarket parts anyway. It then goes on to cite an executive from the R Street Institute, which when founded was meant to be free-market and insurance-focused, according to Insurance Journal. It’s not just the OEM side that’s saying there’s poor-quality aftermarket out there. CAPA and NSF both say the same in promoting their own certified parts. In 2010, Insurance Institute for Highway Safety crash-tested aftermarket bumpers and found varying results. IIHS President Adrian Lund also warned about the difficulty in copying an original collision part.